If you’ve chosen Siesta Key as your top vacation spot this year, you’ll find there are plenty of attractions and activities on this island, from great places to eat with fine and casual dining, miles of beaches, plenty of parks, diverse shopping establishments and shops that rent everything from bicycles to kayaks. Nightlife is teeming on Siesta Key as well as on the Sarasota mainland. Many Siesta Key restaurants and nightclubs provide drinks, outdoor bars and dining, music and more. A cheap and fun way to kick off your night-time activities is to find a place offering Happy Hour. Just like you love to unwind after a tough week at work by relaxing at a Happy Hour with friends and co-workers, you’ll love to sit back and relax after a hard day in the sun and sand while you’re vacationing at Siesta Key. Many great deals are found just over on the mainland. Below we have identified four Happy Hours with great deals in Sarasota. Located less than six miles northeast of Siesta Key, you’ll find Michael’s on East in Sarasota as one of the finest places to enjoy Happy Hour. What can you expect from “Sarasota’s only AAA Four Diamond Award Restaurant”? Only the best, of course. A fine private wine menu and a wide range of flashy cocktails make this a top choice for those in search of Happy Hour. At just $5 a drink during this hour, it’s almost a steal! And there’s food to go along with these wonderful drinks: beef sliders, angel hair onion rings, calamari–need we go on? The ambience matches the level of food and drinks offered: spacious lounge, grand piano, elegant lighting and outdoor covered patio. Come gather with old friends and make new ones at the bar during one of Sarasota’s finest Happy Hours! Just over the bridge into downtown Sarasota you’ll run into Two Senoritas Restaurant–their weekday Happy Hour is from 4 pm – 7 pm and you get such great deals as $2.95 house margaritas, $3.95 frozen margaritas and $3.75 glasses of wine. From 4:30 – 6:30 food deals include discounted appetizers such as nachos, quesadillas, and chips and salsa. 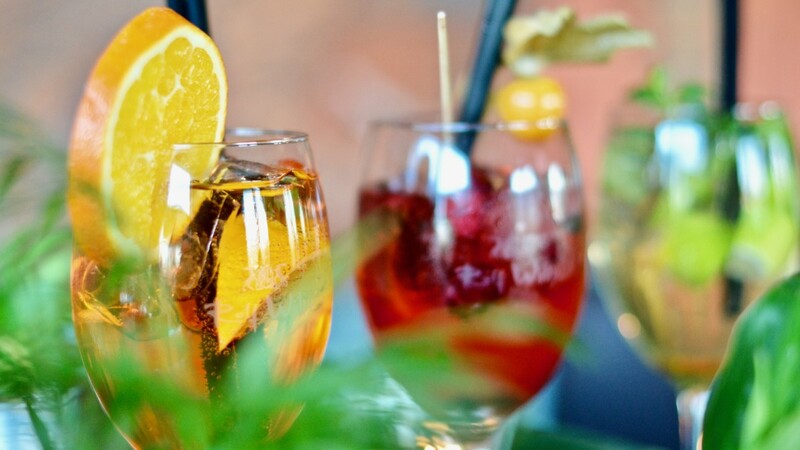 Fun, festive atmosphere, casual setting and what they call the “best selection” of drinks makes Two Senoritas one of the Happy Hour attractions you definitely want to check out when you head into Sarasota. While it’s Happy Hour is only from 5 – 6:30 pm weekdays, you simply can’t beat the deals you’ll find at this First Street dining establishment. This bright and casual restaurant is a prime place to relax and enjoy the Happy Hour deals. Get $1 off both domestic and craft beers. Only $6 for martinis, well drinks and glasses of red or white wine. And $6 bar bites: soups, pommes frites, burger sliders, waffle chips and pepper steak frikadelles. Enjoy these deals at the lounge bar or outdoor patio. There’s no wonder it’s first-come, first-served at this Happy Hour–with these kinds of deals, Bijou Cafe is sure to get a full house real quick. Head on over to Main Street in downtown Sarasota, just 15 minutes from Siesta Key, and you’ll find Mattison’s City Grille. Great dining and a Happy Hour (from 3 pm – 6 pm seven days a week!) you can enjoy at the outside bar and dining area. What makes the deals at Mattison’s so great? Well, for starters, there’s $2 draft beer–24 oz. for just $2! Also, an extensive wine menu, full bar and bar delights from 3 pm – 5 pm offering chicken wings, crab cakes, sashimi and various salads–small appetizers for $5! Get 1/2 off wine, beers and call and well drinks. Live music, too! Mattison’s puts the happy in Happy Hour–come see how they do it!